We want to introduce our newest addition to our OIC family. Please welcome Enrique (Henry) Ortiz our new English as a Second Language Instructor. 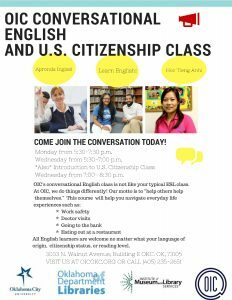 He teaches our Conversational English and Citizenship course. Henry’s class is open to the community on Monday and Wednesday evenings from 5:30-7:30 p.m. Anyone and all are welcome to join in on the conversation. Did your parents go to school? and if so where? My Father went to seminary school, my mother did not attend school. Did you have a favorite subject of study in High School? Did you have a not favorite? Science was my favorite subject, my least favorite was government class. Do you have a favorite book that became a movie? What do you love about teaching? What do you not love? The unnecessary drama is my least favorite aspect of teaching, I just want to share my skills with my students. If OIC had a talent show, what would be your talent? I would produce the show!